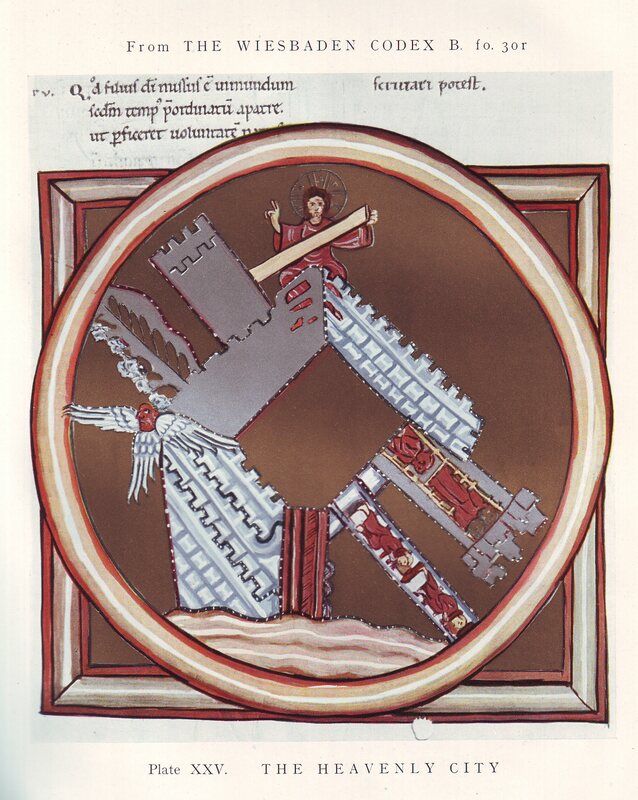 ‘The Heavenly City’, miniature from Scivias (c.1165), reproduced in Charles Singer (ed.) Studies in the History and Method of Science (Oxford, 1917). ‘The head suffers from a certain internal pain which the physicians call migraine…It feels as if there is hammering and pounding in the head. Sound or talking is unbearable, as is light or glare’. – thirteenth-century description of migraine from Bartholomaeus Anglicus, De Proprietatibus Rerum (On The Properties of Things) c.1245. Source: Faith Wallis, Medieval Medicine: A Reader (2010), p. 250. I was reminded last week of one of my favourite books about bodies and illness. In The Absent Body Drew Leder asks a simple question: why, ‘if human experience is so rooted in the bodily, is the body so often absent from experience?’ (p.69-70). Pain, Leder observes, makes our bodies appear to use, it reminds us of their presence. Pain ‘reorganizes our lived space and time, our relations with others and with ourselves’. Bodies that are normally silent, that we take for granted, seize our awareness at times of disturbance. Chronic pain, in particular, forces people into a constant dialogue (so often described in terms of battle) with their bodies. In the case of migraine this seizure is a deeply private one, invisible to those looking on. Leder’s book was one of the main reasons that I decided to look seriously into migraine’s history, to ask how, in different times and places, people have made sense of this often unfathomably painful intrusion of the body into their lives. I first came across phenomenology several years ago. I am certainly no philosopher, but this way of thinking appealed because it is concerned above all with individuals’ relationships and interactions with their own surroundings. Phenomenologists recognise that people do not live in the world of rules and reasons conceived of by science, but in a much messier, more unpredictable world – the ‘lifeworld’. In his foundational book Phenomenology of Perception (1945), Maurice Merleau-Ponty described phenomenology as paying attention to “a general setting in which my body can co-exist with the world” (p.250). In another important text, The Poetics of Space (1958), Gaston Bachelard proposed analysing how people take root, day after day, in a “corner of the world” (p.4). The idea of the ‘lifeworld’ was not a new one. In 1934 Jacob von Uexküll had used the concept to explain how an animal’s existence is experienced through “meaning carriers”. These carriers of significance might include a sensitivity towards heat, or sound. Experience can also be affected by orientation, memories, preconceptions, fears and suspicions. Debbie Ayles, ‘Pre-Migraine’. Credit: Debbie Ayles, Wellcome Images. It is this emphasis on significance that I find most useful for thinking about the history of an illness such as migraine. This is not ‘environmental health’ in the way that we normally consider it, i.e. in terms of pollution and waste, but a much more personal and less tangible kind of relationship – in which noise, smells, light, changes in air-pressure or the phases of the moon are taken seriously. seeing multiple images such as repetitive road signs, lights from other cars coming at me while I was dizzy and not knowing if they were in my lane or not, and rays of colors shooting towards me all at the same time. Yes, I pulled over ASAP on a long, dark country road, scared to death and crying’. People with migraine gain an acute awareness of their surroundings, As can be seen from this quote, and the excerpt I began this post with this kind of environmental awareness has a very long history. I recently received a message from Jenni Nuttall, a Lecturer in English at Oxford University, asking whether I had come across a migraine poem by the fifteenth-century Scottish poet William Dunbar that she had written about on her own blog. This day to mak that I na micht. That scant I luik may on the licht. so much that I cannot write poetry today. that I can scarcely look at the light. There are two more verses of the poem in which Dunbar describes the physical pain of looking at the light and, as Nuttall observes, he also beautifully captures a sense of the migraine aftermath, or ‘postdrome’ – although Dunbar would get up the following morning, his spirit remained asleep, unable to waken for mirth or minstrelcy, revelry or dancing. Miniature of vein man, or a phlebotomy(blood-letting) chart, inscribed ‘Homo venorum’. British Library Egerton MS 2572 f. 50. There is actually a suprising amount of evidence of how medieval people dealt with migraine. 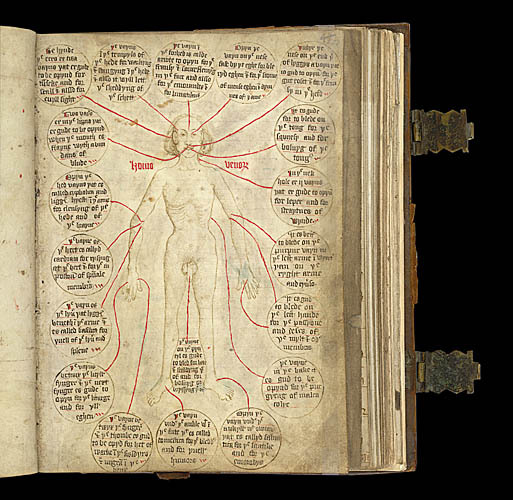 Images of homo venorum often included instructions for bleeding, such as this one in a fifteenth-century guild book of the York Company of Barber Surgeons. The circle in the bottom left hand corner refers to the point between the thumb and first finger of the man’s right hand, and contains instructions in Middle English for treating ‘migram’ by opening the vein between the fingers and the thumb. The literature and imagery of phlebotomy offers some of the earliest evidence in a long history of migraine management in everyday medical practice. Other medieval treatments include a cap made of aloe, myrrh, wheat flour and poppy oil in the thirteenth-century manuscript of Causae et Curae, attributed to Hildegard of Bingen. In eleventh-century Chartres, a patient might have been told to stroke peony root over the site of pain, while a thirteenth-century Welsh text recommends eating a baked or roasted hare’s brain stuffed with rosemary flowers, followed by sleep to treat the ‘migran’. So there is evidence of medieval descriptions of migraine and of treatments, but what is so important about Dunbar’s poem is its expression of something much less tangible, of what people thought a migraine felt like in the fifteenth century. I was delighted to finally learn of this poem, and yet Dunbar is hardly obscure: he was employed by James IV, and his migraine poem has been discussed a number of times. To my knowledge he has yet to be noticed by historians of medicine. This is a wonderful poem – in many ways it seems a staggeringly modern evocation of a migraine – and it certainly deserves to be included in our sources. Migraine: A History – book out soon! The myth of trepanning for migraine, and how it started. A Book! And what to do with 1998? Migraines were taken more seriously in medieval times – where did we go wrong?